NOAH range it’s our new and beautiful product range. 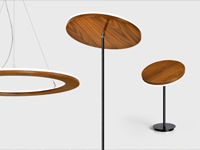 You can find a suspended design awarded version (NOAH) and to complete the range a desk (NOAH /D) or floor (NOAH /F) wood versions. NOAH was inspired by the famous biblical character that received orders from God to build an ark. According to Genesis flood narrative, Noah gathered all his family and all the animal species in one ark (NOAH’s ARK) to escape from the evil of mankind and consequent God’s wrath that destroyed the world through an immense deluge. Just like this ark, NOAH suggests a craft handmade floating object, with natural wood colour finish and indirect light, which creates a calm and warm environment. With circular shape and slim look, NOAH is equipped with the newest LED technology and assures a uniform light output.